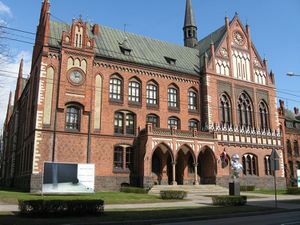 The Art Academy of Latvia is located in Riga, Latvia. They offer a Bachelor degree with the title "Motion. Image. Sound." In this course, students acquire animation directing experience, various animation techniques, as well as classical and digital principles of animation. Diverse usage of time based media is explored in both – linear and poetic visual storytelling. Course language: Latvian, but courses are mainly based on exercises which are discussed individually and in English, if students can't speak Latvian. There are no student exchange reports for this school yet. This page was last edited on 18 December 2018, at 00:58.